These days grabbing your customers attention is more difficult than ever. With marketing messages bombarding consumers it takes a personal touch to stand out in the clutter. 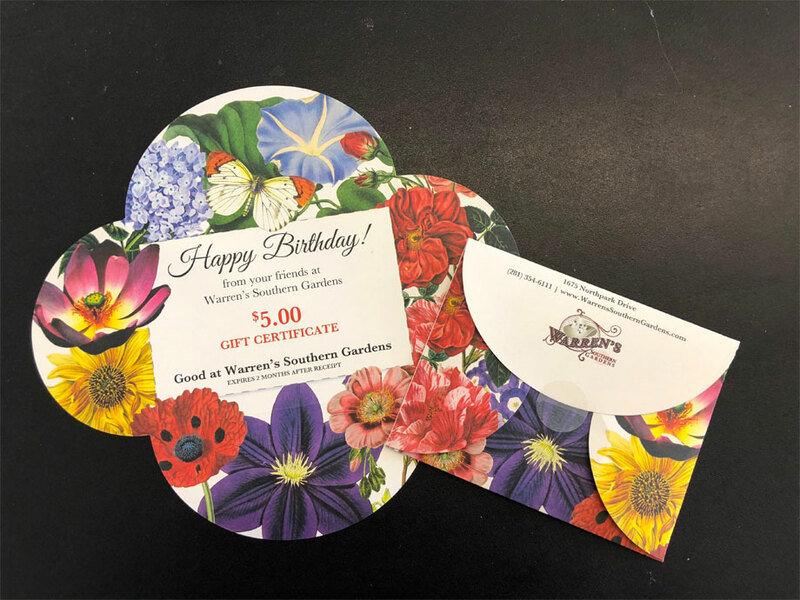 Recently a few of our customers came to us with a project based on a Utah garden center mailer. It takes an effective marketing tool, birthday mailers, and kicks it up a notch. This specialty fold-over mailer required a unique die-cut and scoring to create a colorful ‘blooming’ print piece. The result is a beautiful way to recognize your best customers with birthday greetings or a thank you note that really connects. This piece is best used for short batch mailings as it requires first class postage (stamps) and cannot be sent through automated mail processing. We can customize your mailer with your logo and unique marketing message. Some customers even leave a blank space to write a personal note. What a great way to make a real impact!